Yes it is that time of year when a man's fancy turns to ....ridin' in the dirt! I pounced on the posted ride for Sam's annual spring ride. I've been lucky to have been on the last three and totally enjoyed my fourth spring club ride. 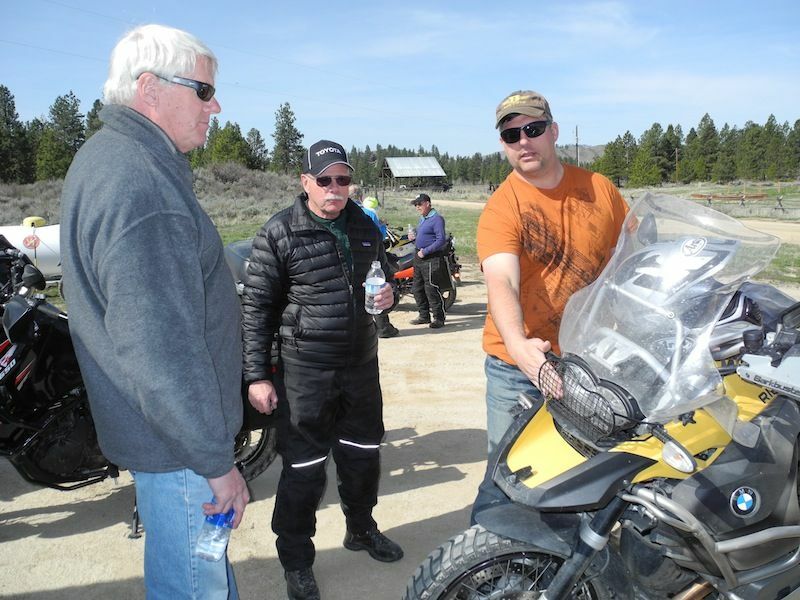 It's great to get out in the Idaho back country with like-minded dual sported spirits, many I've come to know from our rides, workshops and meetings. Sam said to get there early for breakfast as kickstands would be up at 9:00 am.! 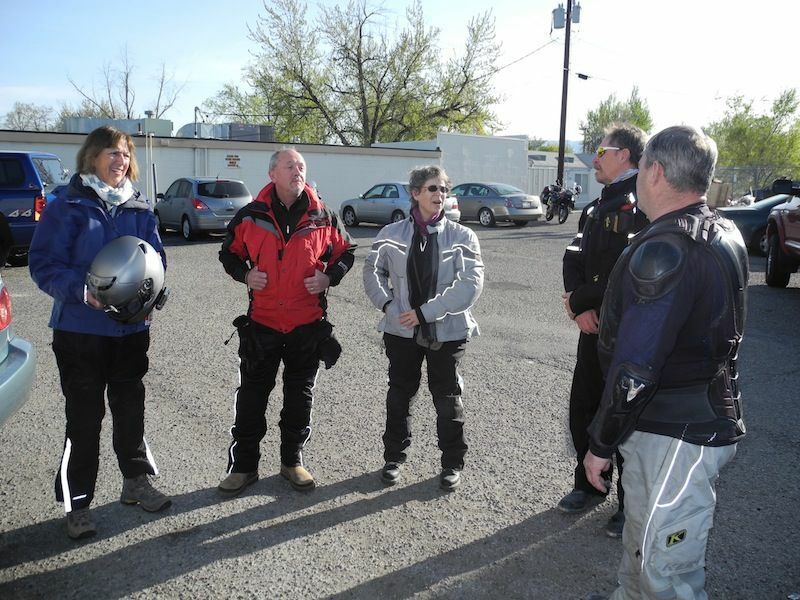 After a hearty breakfast at Rockies on Overland we met in the parking lot to get ridin' rules from the legend hisself. 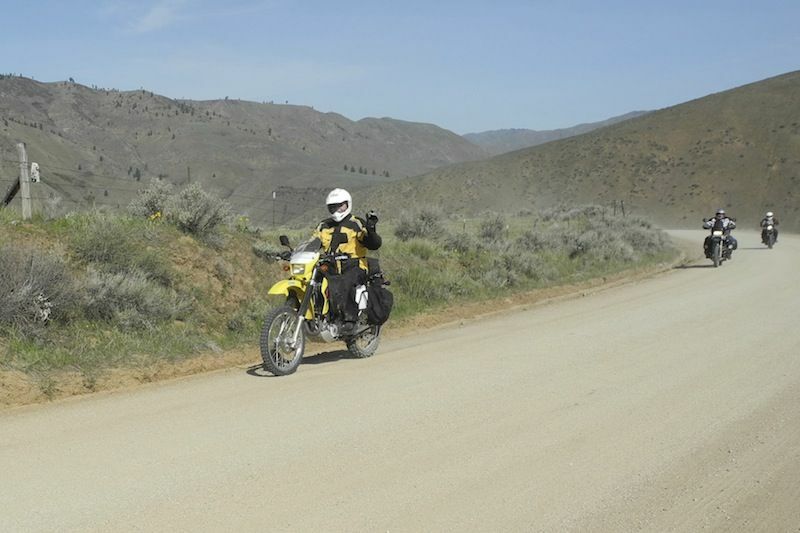 Then it was kickstands up as seventeen dual sport bikes, three riding two-up pulled away and made our way to the Blacks Creek exit on I-84. 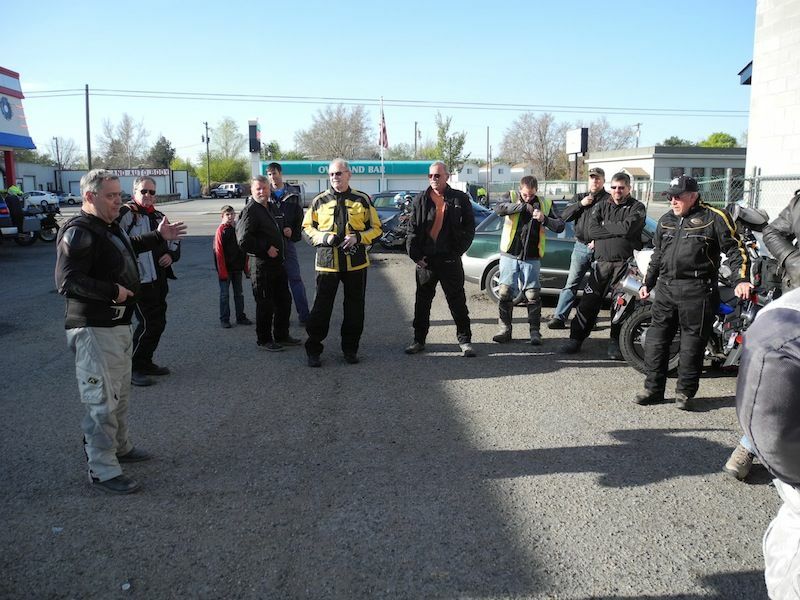 Beemer riders with pillions talkin' to the legend (on right). Do this, don't do that. OMG! Is that the famous RWC in the safety vest? The weather was perfect, Sam had managed to pick the perfect spring day again, and we began the ascent to Prairie stopping at the Willow Creek facility to take advantage of the oppportuny to drain the coffee we'd consumed earlier. 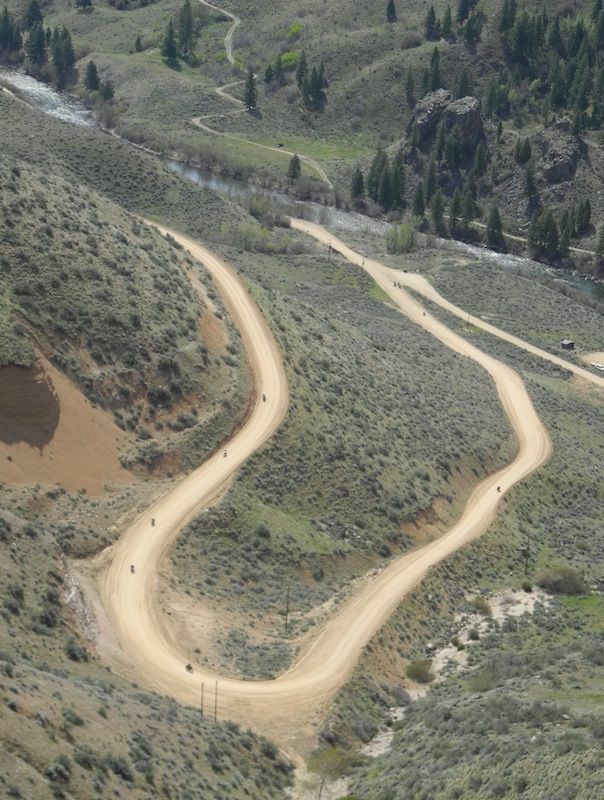 Then it was on to Praire along the scenic South Fork of the Boise River, one of the most spectacular dirt rides anywhere. At the Y-Stop in Prairie we paused for refreshment or a late breakfast or early lunch for those that missed breakfast. 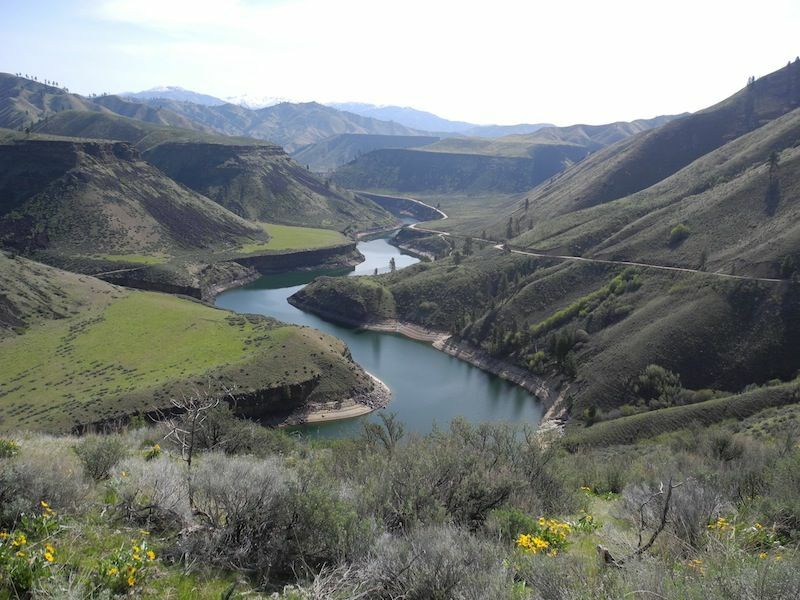 One of my favoritest views in the whole state, a spectacular view of the backwaters of Arrowrock Reservoir on the South Fork Boise River. Been comin' here since I was only as tall as a KLR tire. 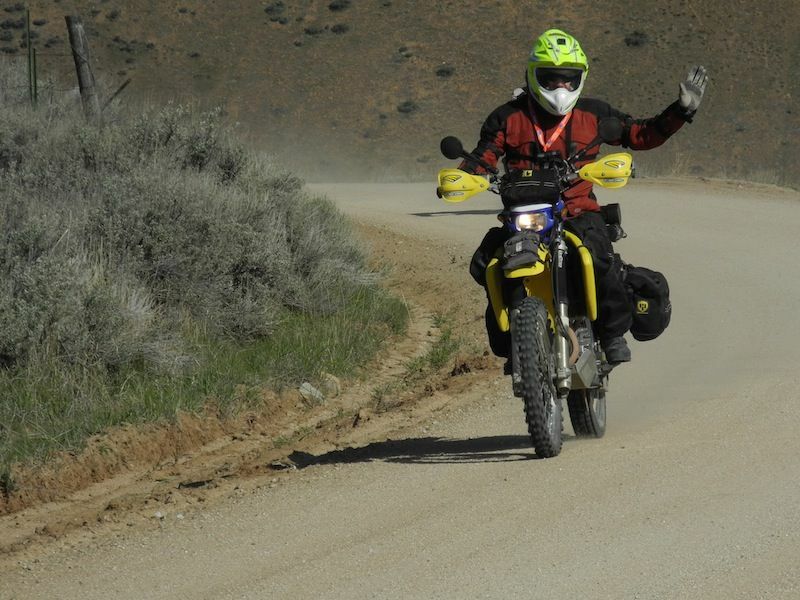 Ol' steelhead enjoyin' his new-to-him DRZ. Lots of happy Suzuki riders on this ride. Dusty ride down to Neal Bridge. 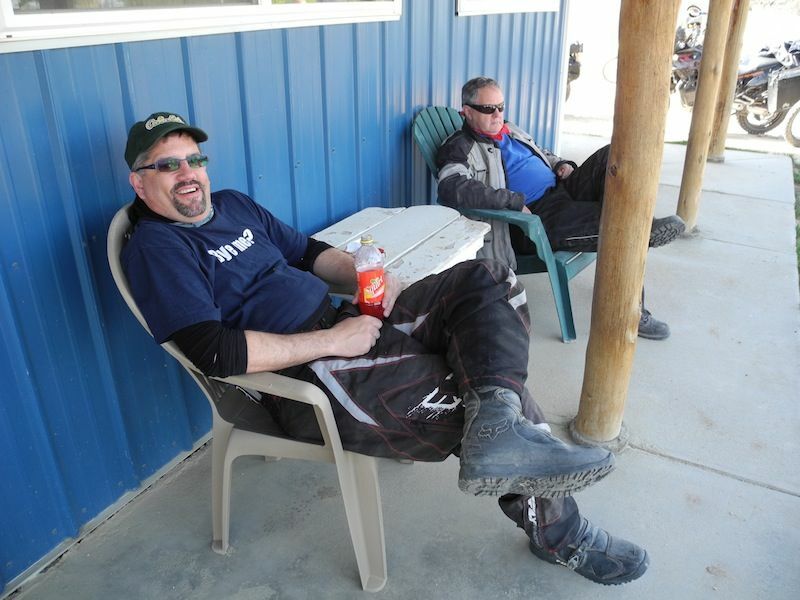 Gary chillin' at the Y.
Riders descend from Prairie, elev. 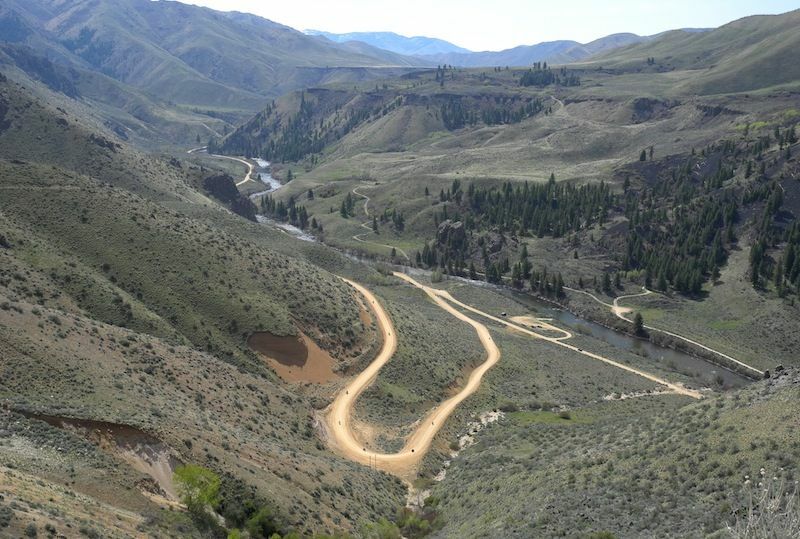 4,780' to the Danskin Bridge on the South Fork. Ten Bikes on the hairpin. Sam then lead us on a descent into the South Fork Canyon, one of the finest rainbow trout rivers in the world, and we travelled up river to cross on the top of Anderson Ranch Reservoir Dam. 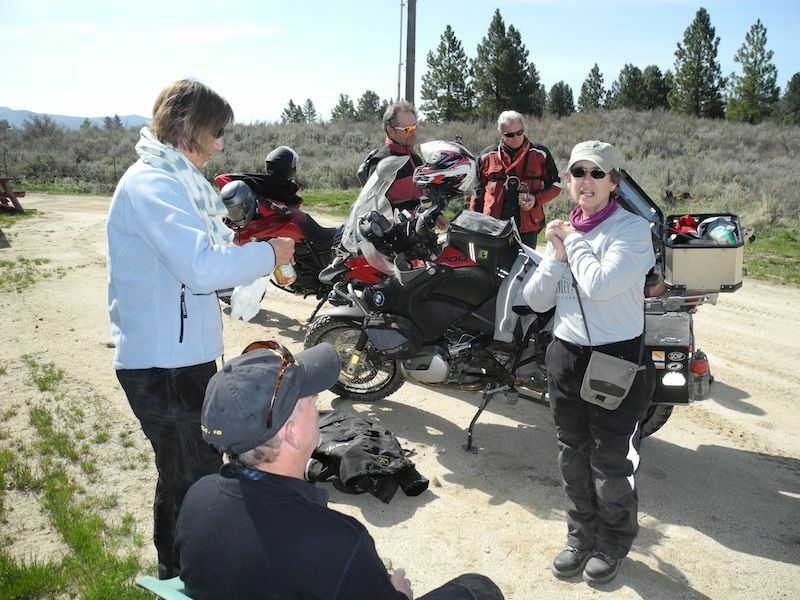 After a short rest and group photo op we rode out of the canyon and on to Highway 20 to the Castle Rock area for a short look around, then it was back to the highway and up the hill to Bennett Mountain Road. Sam's Ride Class of 2013, the 7th. Bennet Mountain Road was in great condition and with our drought-like conditions the snow pack was very light. We kept moving until we reached Alkalai and Wilson Roads which had been freshly covered in several inches of fresh gravel, a biker's nightmare. Everyone managed to survive with only one minor get-off. Hot Creek Road was in great shape and Sam took us to Mountain Home for refills and refreshment. 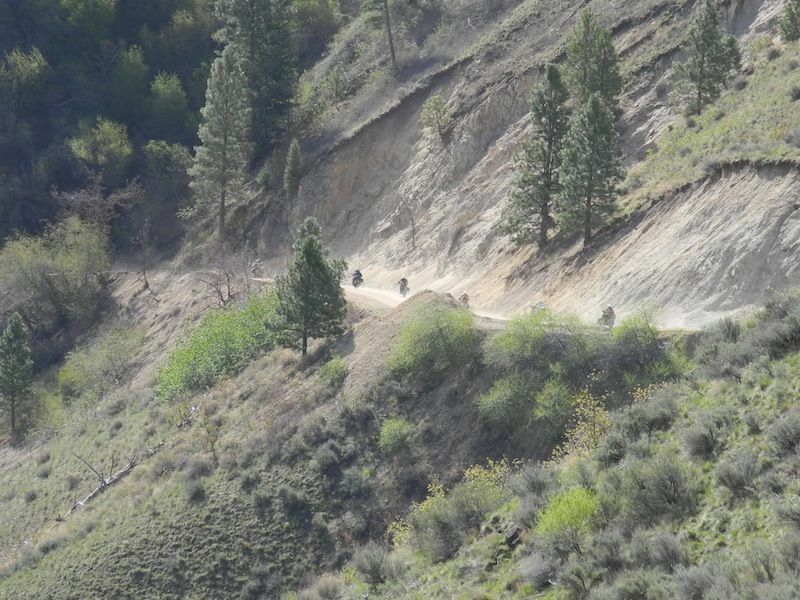 A couple of bikes decided at that point they would take the interstate home while the rest of us took Canyon Creek Road with a stop at oasis-like Canyon Creek Station, a historical site on the original Oregon Trail. See previous Ride Reports. 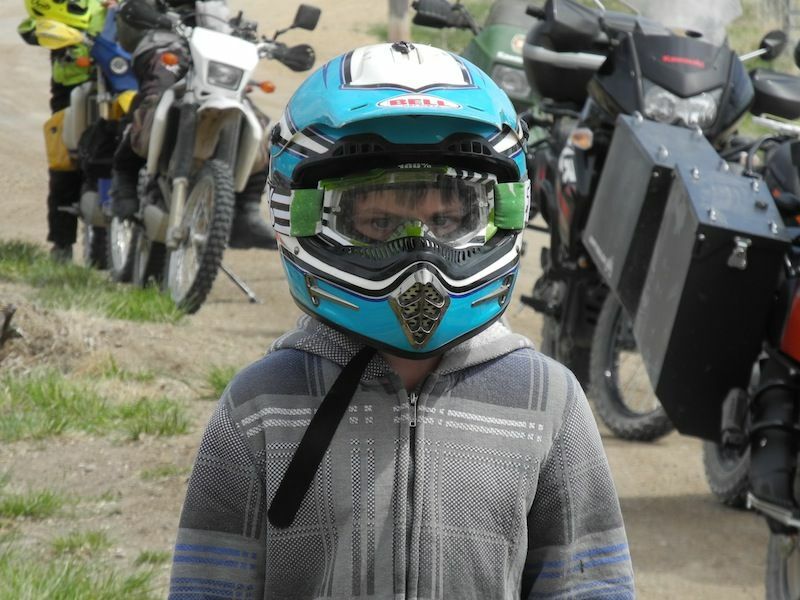 Our youngest pillion, a trouper. After a few photos and a lesson in history from our tour leader we were on Mayfield Road heading homeward. 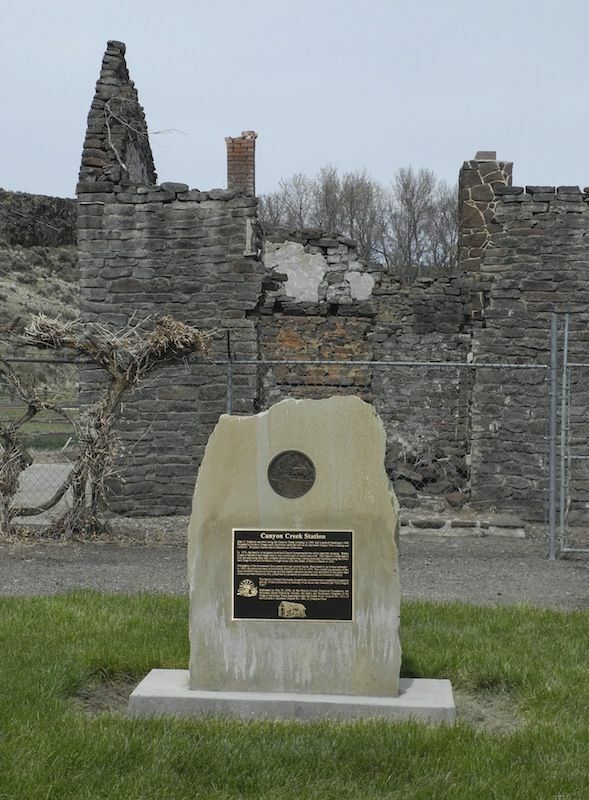 Mayfield was (is) on the Oregon Trail and those making their way west must have been encouraged and delighted to encounter this slice of paradise. 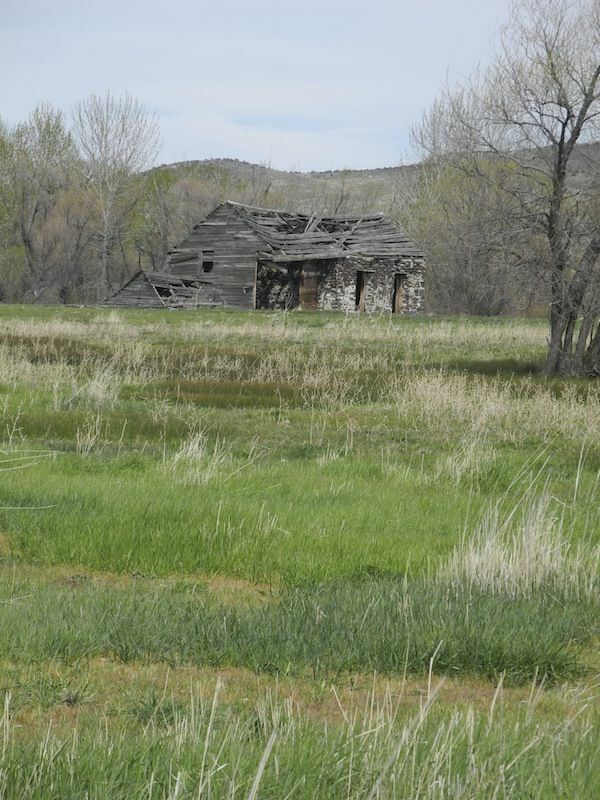 Now abandoned Mayfield was once a prosperous community of farmers and ranchers whose remaining buildings now stand as silent reminders of lives well spent at the beginning of the 20th Century. 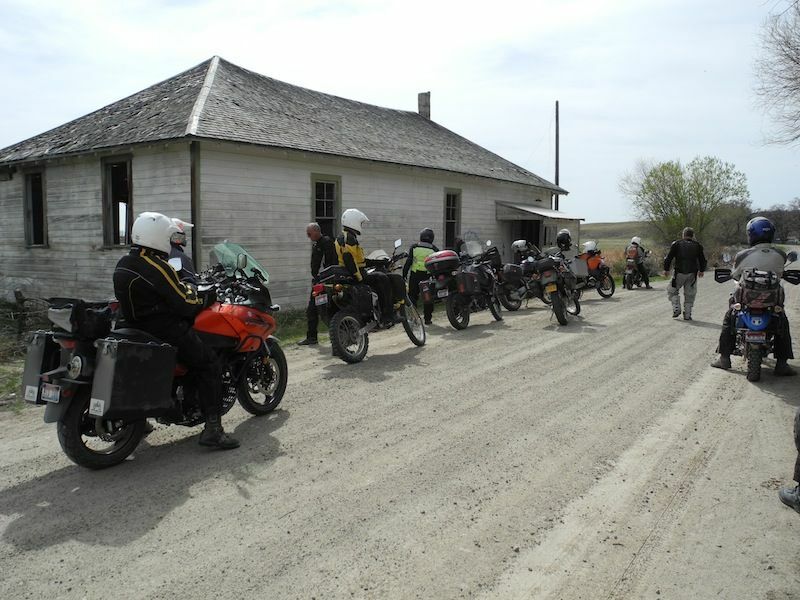 Our last stop at the Mayfield Grange Hall before splitting up. After saying our "good-byes" we headed back to join Black's Creek Road then merged with the metro traffic on our way home. Thanks again Sam for a dusty but great ride. We missed you capt. ed. Hope all of you that missed this one make next years ride. GPS read 196miles, 5:22 riding time.